I swear that I must have the slowest growing hair ever. I’ve never had the patience to completely grow it out because it takes so long! The only time it ever seems to grow is when I am pregnant. I have two daughters, and with both pregnancies my hair never looked better. Unfortunately, as soon as I had both my girls, my hair not only stopped growing but started falling out as well. I definitely was not going bald or anything like that but it was kind of gross because I always had hair all over my brush, and all over my clothes. One day, my mother was running to the store and asked if I needed anything. I asked her if she could pick me up some prenatal vitamins because I thought maybe that might help with my hair situation. She didn’t see any prenatal vitamins at the store, so she just grabbed these “Hair, Skin, and Nails” vitamins from “Nature’s Bounty”. I was kind of hesitant to try these— I don’t know exactly what it is, but these kinds of vitamins make me suspicious. I started taking these, and I was amazed at the difference that I noticed right away. I have had soooo many people comment on how long my hair is getting, and how healthy it looks. Not only is my hair looking great, but my skin and nails are also looking amazing. Fortunately, I have never been prone to acne but I get the occasional break outs. These pills, when taken daily, keep my skin looking clear, and healthy. My nails are growing super fast, as fast as they did when I was pregnant. They are not only growing fast, but they are very healthy. These vitamins have been AMAZING for me! I can not recommend them enough! 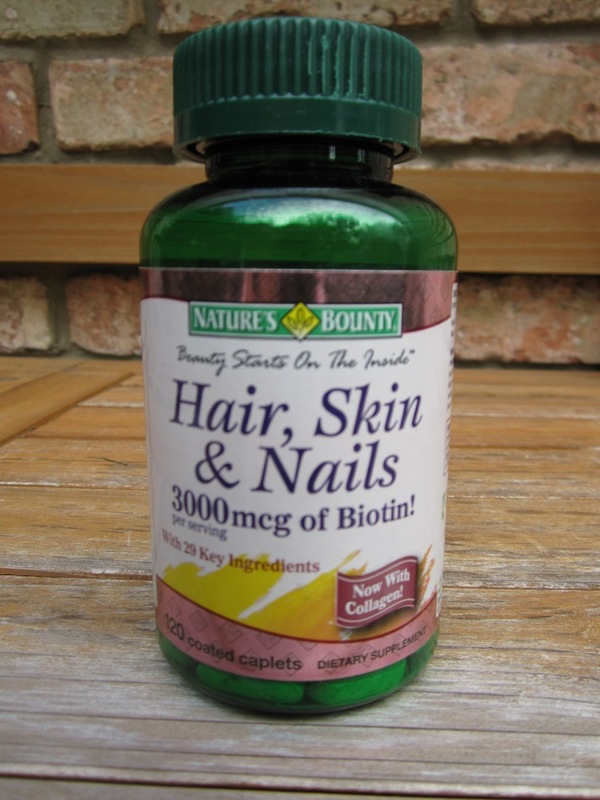 Overall opinion: If you are good at remembering to take vitamins daily and pill size is not an issue for you, then these vitamins will make your hair, skin, and nails look better then ever! They can be found at your local drug store or on Amazon. This entry was posted in Beauty, Hair, Reviews, vitamins and tagged drug store, grow hair, hair, hair loss, hair products, nails, natures bounty, skin, vitamins. Bookmark the permalink. Oh this makes me excited. I’ve seen those before and always wondered if they worked. My hair is so limp, thin and dark since I’ve had Scout and my nails and face have broken and broken out a lot more as well. I’ll have to pick some up next time I’m at HEB. Just want to say your article is as astonishing. The clarity for your put up is just cool and i could think you are an expert on this subject. Fine along with your permission allow me to grasp your feed to stay up to date with approaching post. Thank you a million and please keep up the gratifying work. do u think they r gud for breastfeeding mothers too?